In Sierra Leone: "Then Ebola hit." Beginning a journey in Sierra Leone to report on the heroic response to Ebola and recovery efforts. From Freetown, Sierra Leone’s capital, through the country’s Kono District, I spent 8 days traveling through the nation, witnessing and hearing of Ebola’s impact on the lives of teachers, students, health care workers, district leaders, farmers, diamond miners, and more. Every tier of Sierra Leonean society has been heavily impacted by the spread of Ebola. As of May 15th, Kono, in Sierra Leone’s east, has gone 79 days without a confirmed case. Although the district has eclipsed the all-important 42-day benchmark of zero cases, new Ebola cases are still showing up unpredictably and in multiple districts across Sierra Leone. There have been a total of 8,585 cases of Ebola in Sierra Leone with 3,529 confirmed deaths. Further, Ebola has also gravely affected those not infected by the disease. It is easy to overlook this fact when reading about the situation from afar, but impossible to avoid it up close. I hope that these stories reach beyond headlines and past statistics. I also hope that my own thoughts continue to evolve after returning to Global Citizen's home base in NYC, influenced by all those I met in such a beautiful and brave country. You can read more about this trip by clicking here. I heard tales of small businesses folding up, visa applications and interviews in process put on hold, development projects grounded to a halt, and classrooms closing. Indefinitely. Most Sierra Leoneans were steadfast in keeping conversations away from the topic of Ebola. Yet still, Ebola’s reach and scale always seeped through. Small tales that invariably revealed the visible arrest and disintegration of progress and development in Sierra Leone. Ebola’s wake is wide and all-encompassing, causing the collapse of micro-economic systems, straining family units, and of course, taking many lives and affecting even more. To make the matter worse, all this impact has occurred just several years after a tragic 11-year civil war that severely intensified Sierra Leone’s level of poverty, took 70,000 lives, displaced more than half the population, sparked a drastic decline in agriculture, rocketed food prices, and destroyed the country’s health care system. Following this gloomy period in Sierra Leone’s history, the country achieved the status of the second fastest growing economy in the world. The country was progressing in the right direction until Ebola, an invisible enemy this time, wiped away 30% of Sierra Leone’s economy. 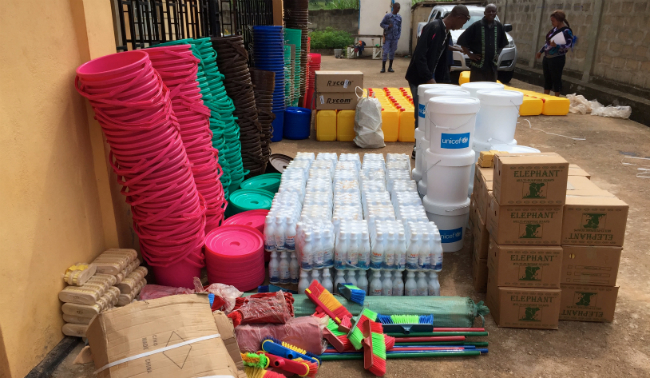 Cleaning supplies are pulled together before distribution to 481 schools in Kono, Sierra Leone. Ebola will be still be present and felt beyond reaching the landmark of zero cases. Sierra Leoneans will continue to cope with an agricultural nosedive that has affected farmers, a group that makes up 66% of Sierra Leone’s population. They will endure skipped meals to cope with sky-high food prices. They will pull together to survive in village economies with no demand, and no supply. Spikes in child pregnancies, food-insecurity, and the re-emergence of other infectious diseases (Measles, Tuberculosis, AIDS) have added urgency to the lingering pain embedded deep in the minds and memories of Sierra Leoneans. These public health and societal ills are not permanent, but mitigation and direct intervention is an up-hill battle. The present struggle to eradicate all positive tests for the Ebola virus has led to an impressive level of international support and local leadership, but these distressful conditions and consequences of Ebola will not dissipate once beds are cleared of Ebola patients. I have been reading about Ebola’s alarming and unprecedented scale of impact for months while leading on Ebola-response and recovery campaigning for Global Citizen. However, reading tragedy in the news, trying to understand mass impact through statistics, and sensing crisis solely through phone calls to our NGO partners did not suffice or come close to illustrating on-the ground realities. 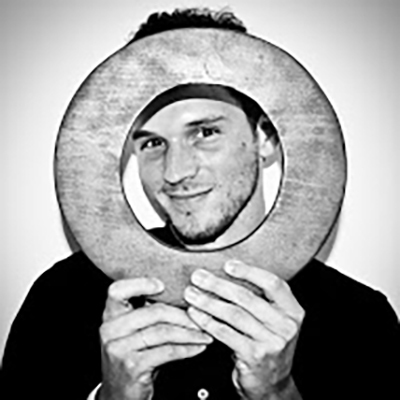 After hearing stories of lives stretched thin, opportunity stagnant, and hope dim, broad scale statistics boiled down to the fluid personal stories that constitute tenths of percentage points and small units in tallies numbering in the thousands. I'm now convinced, more than ever, that there is no way to quantify Sierra Leone's battle against Ebola over the last 9-months, the present struggle, nor the craters of socio-economic damage caused by the disease. 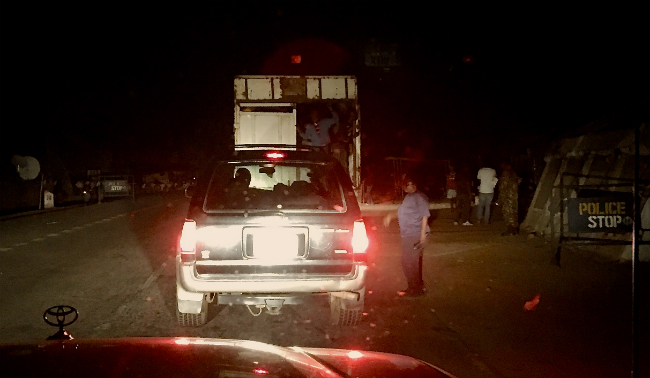 Ebola checkpoint on the road from Freetown to Kono, there were 14 on the 220 mile journey. One thing is certain - resiliency is in abundance from the beaches of Freetown to the hollowed-out diamond mining villages of Kono. Ebola has forced Sierra Leoneans to quietly acquiesce to unwritten laws banning physical contact and social gatherings, yet communities and families are still finding ways to come together and work towards stablization and recovery. At times, the struggle to survive in the time of Ebola has required resorting to disheartening and disconcerting solutions (students becoming laborers, teachers becoming Ebola contact tracers). However, deep within personal and familial efforts to brave the crisis lies an unshakable conviction to not only heal home villages and the country as a whole, but also to emerge stronger. After a late arrival to our hotel in Freetown on our first night in Sierra Leone, I woke up and took a walk, discovering a beautiful Sierra Leonean coast line (the landscape image at the top of the story), a stunning visual that never factored in to my previously bleak view of Sierra Leone’s current situation. Abu Bakarr’s declarative words, and his recently reopened kiosk (appropriately named “Charisma”), provide me with my own tempered form of optimism: While reaching zero cases of Ebola is on the horizon, Ebola’s harrowing impact is still visible and hasn’t yet been addressed. READ MORE of In the time of Ebola.